Very quickly during my first year at the middle school level I discovered the need to automate the pass system. In the past study hall teachers gave permission for a few students to come during each period. This was problematic because I was transitioning the library into a learning commons model. I wanted and still want to create self-directed learners and all students would need access to the library by their own choice. Putting the power into the hands of the students continues to be important to me. This is how students sign into the computer. Although students do forget to sign up for the library there are still ways for them to gain access. They can get a project pass (from the teacher they have a project with) or come on a ten minute pass to get a book. 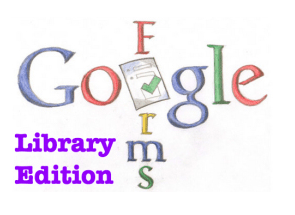 All students go into the google spreadsheet which is accessible from the library website to anyone (staff and student alike). As you can see the Google Spreadsheet the students come in to cross their name out is not the same as the spreadsheet created with a Google Form. I do have to create an additional spreadsheet. However, once it is created the entire sorting process in the morning takes at most 10 minutes. I have even done it in five on a busy morning (what morning is not busy :)) I can see the revision history so if any funny business goes on it is easily viewable. I can access the spreadsheet from any computer or device. The form itself can be viewed here and it is embedded into my website. The students can add this link to their devices and can sign up in the library. One of my catalog computers has been turned into a sign up machines/catalog. Most students use that computer to sign up. I am working on getting the students to use it beyond the library. Interestingly I did see a student the other day signing up in their study halls. That was great…I want students to be self-sufficient.